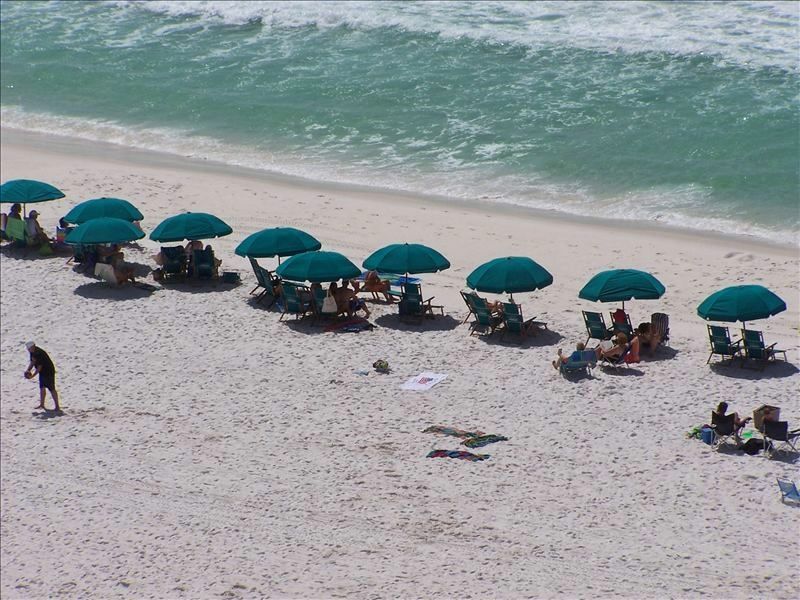 A perfect family resort located directly on the beach in the heart of Destin. Pelican Beach Resort is first class with its amenities. The location is right across the street from the Big Kuhuna Water park, and near many great restaurants. Pelican Beach Resort has 2 heated pools, one strictly outdoor and an indoor/outdoor pool, a kiddie pool and a hot tub. There is an extra large sunning deck right next to the tiki hut, adjacent to the pool. In addition, there is a work out facility, game room, tennis courts, basketball, covered parking, umbrella and chair rentals, and a seasonal deli/restaurant/convenience store on site. Located on the 11th floor where ocean/beach views can been seen from the living room, dining room, and master bedroom, our 2 bedroom/2 bath condo comes fully equipped with everything you need for a comfortable stay. There is a king size bed in the master bedroom and 2 twin beds in the 2nd bedroom. The living room has a sofa sleeper. There is a washer and dryer in the condo. NOTES: 6 GUEST MAX PER CONDO IS STRICTLY ENFORCED. IN ADDITION, THERE MUST BE ONE PERSON OVER AGE 25 PER 3 PEOPLE UNDER, AND AT LEAST ONE HAS TO BE A PARENT TO ONE OF THE ONES UNDER AGE 25. THIS IS A RESORT RULE, AND THE OWNERS HAVE NO CONTROL OVER IT. ID IS CHECKED AND SECURITY BRACLETS ARE GIVEN TO EACH GUEST. My husband and I live in St. Louis, MO. We have two kids. We spent many summers vacationing in Destin and always preferred staying at Pelican Beach. When the opportunity came up to purchase our own condo we were thrilled. We love that other families enjoy staying in our condo for their vacation. Room was amazing very clean and in the most convenient spot ever!!!! Very nice condo. Gail was extremely helpful. Nice condo. Everything was clean and as expected. Would definitely go back. The condo was very nice. Clean and exactly as stated in the description. Will definitely rent again. Thank you Debbie. I'm glad it worked out for you. The owners are very nice! Answer question promptly. The condo was a great size, beds were comfortable and the place was clean. Thanks, it was a pleasure working with you. Please keep us in mind in the future. The condo was great with beautiful views from the balcony and also from the front door! Really enjoyed our stayed there! Will definetely be back! Thanks for the great review. I'm glad it worked out so well your family. Clean, comfortable beds and furniture. Great location! Beautiful view of sunrise. This facility has a tiki bar and cafe that was so convenient for days we didn’t want to leave the site. Will definitely stay here, in this condo, again! Thank you for the great review. Hope you can come back again soon.